Enhance your eye color with our beautiful Kazzue? Premier contact lenses. 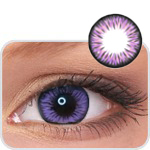 These vibrant yet naturally blend design color contact lenses gives you an instant dolly look with its 15mm huge diameter size. These contact lenses are specially designed to give you an instant change in color plus making your eyes look bigger, brighter and more defined. Kazzue Premier Contact Lenses come in a fantastic choice of colours, suitable for both light and dark colored eyes.